Constructed from 1/4? thick brushed stainless steel bars, each piece is meticulously welded and finished to create a seamless line which appears to float on the wall. The rack mounts to the wall with two screws. 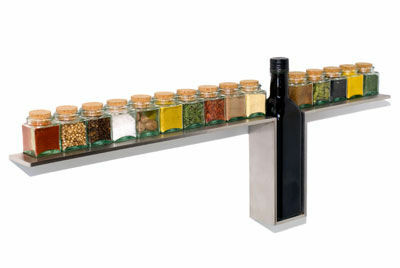 Each spice rack comes with 15 glass mini cube bottles with cork tops. The olive oil bottle is not included, but most standard size bottles will fit.